An extremely hardy floribunda rose, Nearly Wild has single, medium-pink blossoms that cover the plant from early summmer until frost. 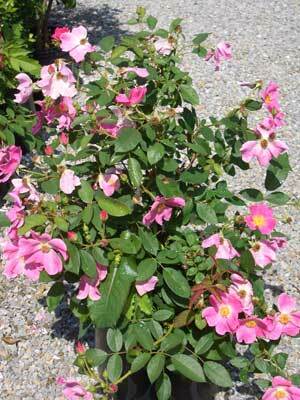 Since it blooms constantly and only grows up to 2 feet tall and 3 feet wide, it is a very versatile rose. It can be used to enhance perennial beds, as an edging plant or by itself. It grows best in full sun and is winter hardy to the snowline in northern Zone 4.